Kent,In 2007, I purchased N2829H (1946 Ercoupe 415-C). While flying her back from Vermont to Tennessee, we noticed very poor performance from the fixed pitch prop and tired engine. It used to take a lot of runway to get her into the air. While researching the TC for the Ercoupe, I notice that the Aeromatic F-200 was listed as an alternate prop. After further research, I found a new F-200 only 30 miles away that had never been installed. After purchasing the propeller and finding you, I am pleased to say that it now resides on the front of my Coupe. I have since done a zero time rebuild on the Continental C-75 engine, and installed the Aeromatic, boy does she jump off of the runway quick. At altitude, she now develops a TAS of 105. I am sure that the prop has made a huge difference in the performance, and coupled with the new rebuild on the engine, I am now anxious to get her out and flying as much as possible. From what I can tell in conversing with other Coupe owners, most of them never even knew that they were available on the planes. I am going to do everything I can to make sure that they know it now. I love the prop. I just wanted to give you an update on the progress I've made with the Aeromatic on my O-235C1 powered Piper PA-16 Clipper. F200 hub with 73E blades, assy. #4368. After having some problems with a slight engine overspeed on takeoff (~2900 instead of 2800 specified), I adjusted the static rpm to the low side of the Aeromatic specs. It was 2750 and I removed one shim and it dropped to 2700---in spec, but on the lower limit. The weights I have settled on are 2 (-9), 2 (-4), 1 (-3), and 1 (-1) for 10.25 oz. per side. With this setup, I get 2800 on takeoff roll, 2625 at max climb speed (75mph), and 2525 at max level flight at low level for about 115mph. At 2350 cruise, I get about 100 mph. This is very satisfactory performance for this airplane considering field elevation is 4090. My next undertaking will be to carry some extra weights along and fly over to Roseburg to figure out my setup for lower elevations. I'm guessing that I will have to add ~1/2 oz. per side when below 1000' msl. Just wanted to let you know that the prop is working very well for me. The propeller you built for our Cruisair is working beautifully. It sure has breathed new life into the airplane. We get outstanding climb performance and a little better cruise performance as well. One thing we'd like to know is who manufactured our hub originally. Is it a Koppers, Univair, or Kinetics? Do you know? Any information you could provide would be appreciated. Again, thanks for a great prop. It really is purdy and works very well to boot. I just wanted to tell you a bit about my installation of your prop on my Swift, N3825K. I have a 145HP Continental O300C in my Swift, and I wanted a propeller which would allow me to access all that power. The type certificate for the Swift restricts the selection of fixed pitch propellers in the Continental O300 series (a 145HP engine at 2700 rpm) to props that will not turn faster than 2500 RPM, effectively limiting the engine to a maximum of only 125HP. I consulted noted Swift expert Jim Montague about the Aeromatic, and he advised me strongly against it. I don't think he has ever flown behind a properly set up Aeromatic, so I got a second opinion. 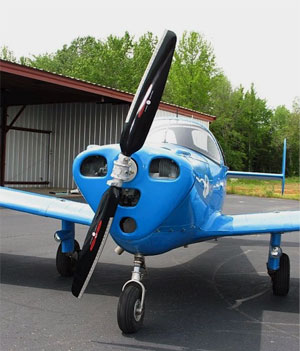 Don Bartholomew had flown hundreds of hours behind an Aeromatic in a stock 125 Swift, and said that the prop was a good one. It would climb better than an intermediate prop, and cruise better than an intermediate prop. It wouldn't climb better than a climb prop, and wouldn't cruise better than a cruise prop, but it would get close to those performance figures. I contacted Roger Pesuit of the FAA propulsion division and got his opinion. He thought that your propeller was exactly what I needed. Of course, you remember you had to custom design a hub which would match up with my Continental O300C six bolt flange. Roger Pesuit of the Los Angeles FAA propulsion division was instrumental in getting that approved. I'm sure you remember the challenges we faced getting the installation just right. For two and a half days, we could not get the propeller to respond properly to adjustments. Then, on Wednesday afternoon, everything fell into place. Well, now that I have a few more hours flying behind it, I thought I would let you know how it is working out. 1. It works as advertised. Takeoff, Climb, and Cruise RPM is all nice and high, right up against the limit. Takeoff rolls are quite a bit shorter than before with a 60" pitch Sensenich. Climb speed is an initial 1000FPM with me solo at 1000' AGL field. Up in Nevada, with two men in the cockpit, we climbed at 500FPM from 4700'. I had plenty of power to make a go around with two men in the cockpit, gear and flaps down. With my fixed pitch, with two men on board, we could only climb at 300FPM from sea level. Cruise is also a lot faster. I've seen indicated speeds of 140-150 MPH at 3500' MSL. Never less than 135MPH at altitudes of 5500'. This is up from a top speed of 128 MPH with the fixed pitch prop. 2. High altitude cruise is interesting, because as you climb, the prop RPM slows down. I have an effective ceiling of about 10500' solo. That is at 90 MPH and full power. For much of the nation, that is immaterial, but here in California, I am looking way up at a lot of mountains. Overall, the prop is terrific below 5000', RPM drop becomes noticeable but not too much of a problem all the way to 8500, and past that, it is a slow, slow climb with a low RPM. Of course, with the fixed pitch prop, I had a hard time getting above 6500' with two men on board, so I guess it is hard to complain about. I just want people to know that below 5000', the prop is terrific, and above that the way it functions becomes self-limiting. Overall, I am quite happy with the propeller, and would recommend it to anyone with a classic engine which cannot take a variable pitch prop. It really is almost a constant speed prop. I find myself using manifold pressure exclusively for power adjustments. It's lightweight, good looking (I have mine varnished, so everyone knows I'm swinging lumber) and effortless on the part of the pilot. In summation, I'm glad I didn't take Jim Montague's advice. He knows a lot about the Swift, but I think his opinion on this prop is incorrect. Sorry it has taken me so long to write. I flew the Culver up to Connecticut on January 3, and thought you might like to see the performance improvements I noted over the old fixed pitch cruise prop. First the takeoff run has been greatly reduced, the initial climb is outstanding and cruise climb rate is greatly improved from an average 250 FPM to Over 500 FPM up to 5500 feet. Now of course those improvements would mean nothing if the prop improved climb at the sacrifice of cruise. The cruise was the same or better than it had been with the Sensenich cruise prop. It seems the Aeromatic Blades are very efficient. At 7500 feet, an altitude it would have taken forever to get to with the cruise prop, full throttle yielded 22" MP, 2400 RPM, and 112 MPH IAS, for a TAS of 125. Altimeter 30.41 OAT +10F. With the Aeromatic I am no longer concerned with clearing the obstacles on takeoff because I can slow to 60 MPH and climb right over them, instead of trying to accelerate to 80 and just barely clear them. Thanks for returning this great propeller to production. On an aircraft like the Culver where the original design was optimized for speed using a minimum of horsepower, 90, the Aeromatic gives the maximum performance throughout the flight envelope.